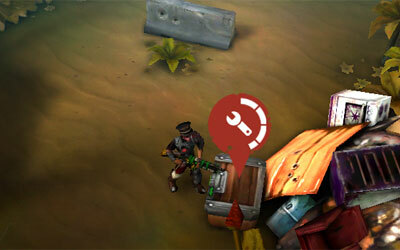 The common chests contain treasure and can be found throughout the campaign. Opening a common chest requires a player to come close to it, and he may not shoot while he does so, but one may run around close and still opens a chest. In chapter 3, one can shoot and open a chest at the same time (to improve gameplay experience). If one leaves the chest, the progress bar would pause and then reverses. Opening a common chests would reward a player with some silver, sometimes together with boosts. In rare occasions, one may find a piece of crystal in the common chests. Unlike secret chests, common chests can be opened again the next time you play that chapter. Common chests are located in various parts of the campaign maps, usually hidden around the corner, behind some gates or barricades, across a little bridge, or near the mutant chiefs. For the common chests near the chapter bosses that can only be opened after the bosses are defeated, there would always be some crystals, silver and boosts.